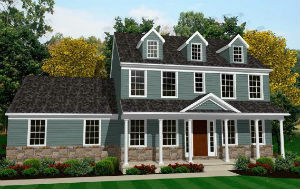 Find the right home in the new Manchester Township community, Rolling Meadows. Great amenities and a wide selection of floor plans make this community by Keystone Custom Homes perfect for families. Variety is the name of the game with unique floor plans like the Windsor, Belmont and Langston with prices in the community starting in the $150,000s. The Belmont floor plan with Traditional elevation is a stylish home with three bedrooms and two bathrooms and priced from $166,236. The one car garage can be expanded for two cars, and the landscaped patio is great for hosting summer cookouts. Families who need more space can appreciate the Windsor floor plan with Heritage elevation. The large kitchen features a breakfast space, and the family room is great for movie nights or inviting over guests for the big game. The owner’s suite upstairs includes a large walk-in closet and a bathroom with garden tub and dual vanities. Three more bedrooms and a bathroom round out the cozy top floor. This gorgeous home is priced from $183,236. Keystone Custom Homes and is built with a unique sense of style. Relax in the open family room area off the foyer, and cook family favorites in the kitchen that includes an island and pantry. Enjoy meals outside with the optional patio with landscaping. Rest and recharge in the three bedrooms upstairs. Prices for the Langston floor plan start at $156,235. Keep active in Rolling Meadows with the tennis courts and swimming pool, or grab a bite to eat at unique restaurants just minutes away off Routes 30 and 283.